In context: While YouTube collects performance data from its client apps, they're looking at hardware to improve stream quality, push new technologies and develop new trends by keeping an eye on mobile phone innovation. 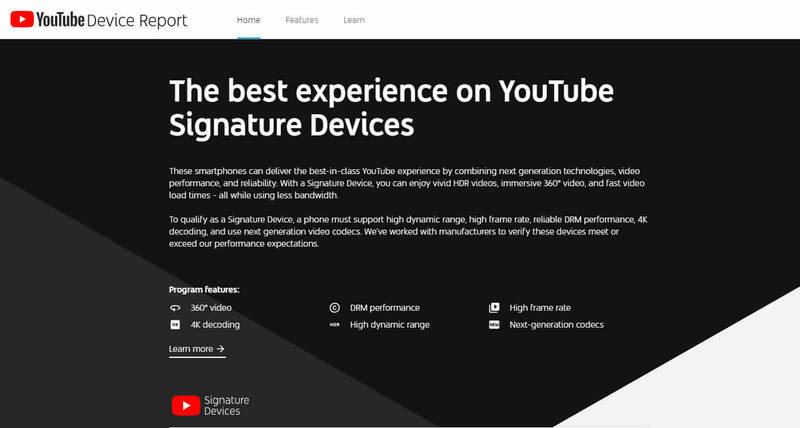 To qualify for the certification, smartphones must support a number of features and pass rigorous performance testing by the YouTube team. These include high dynamic range support, high framerate playback, support for next-gen codecs, 4K video decoding, DRM support and 360-degree video performance. If the feature set doesn't already intimidate, you can see for yourself that YouTube has set the bar very high: the current listing contains only flagship devices. The roster includes a mere 19 smartphones from Samsung, LG, Google, Huawei, Xiaomi, Nokia, HTC, OnePlus and Sony. Apple is notably absent, and will remain so, we believe, till the day its devices begin supporting the VP9 video codec. The purpose behind YouTube's Device Report site seems to be that while Jane Q. Public can look up if her hard-earned money was well spent, YouTube will regularly raise the requirements and only the crème de la crème will remain listed. YouTube is working with a number of smarpthone manufacturers, but others all comers are welcome and encouraged to submit units, current and future, for testing. These devices will provide YouTube critical information on new hardware features and trends that come to market, features that it can support and trends it can monetize. At its most benign, by keeping an eye on the arrival of new technology, YouTube can push the envelope when it comes to streaming performance on mobile devices, allowing it to deliver silky smooth playback experience. The site is live and open to any visitors, so if you just really must know if your smartphone is that good at playing back videos on YouTube, you can the service here.